So, I guess the only thing to write about (even though I don't want to write, I want to go to bed with my new body pillow - awesome - and my Hypnobirthing CD - relaxing - and maybe even a hot water bottle - to really luxuriate it up - to kill this major headache coming on) is this little half-baked human person inside my uterus. He is actually half-baked. 20 weeks + 6 days meaning just slightly less than 20 weeks until my due date. 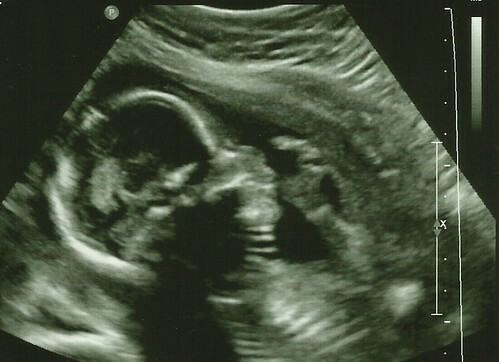 And yes, the little human person inside my uterus IS a -DRUM ROLL PLEASE - 'he'. Yippee!! Scott is over the moon. He is just so happy. So am I. I really, really wanted a wee boy, a son. But I'm also really, really terrified. What the heck am I going to do with a boy?! I mean, girls are so easy. Girls go to dance lessons and like getting their nails and hair done. They can wear the same dress for years, first as a full length, then to knee-length, then it becomes a shirt. They also don't pee in the air when you change their nappies. But what on earth do you do with a boy? Kick a football? Play with sticks? I suppose there are worse things in life. Like drugs and prison. I jest. If our son turns out to be a geek, more power to him. Geeks are the new jocks. I mean, when was the last time you watched a film where the jock was the hero? More often these days, it's the geek who wins, not because of the out-played concept of the underdog, but because the geek always proves he is way more awesome because he is smarter than the protagonist. Geeks rule. Geeks are the money-makers. Geeks wear cardigans. I think I'd be quite happy with a geek actually. Anyway, before I start planning his personality for him, I think I better just focus on growing him. Which means destressing, losing this headache, and going to bed with my pillow and my hypnotherapy. Oh, and the name? Don't ask, it's a secret!